12V 2Pin 40 X 40 X 10MM Brushless DC Cooling Cooler Fan. Perfect for your Computer Case or CPU Cooling, also used with 3-D Printers and Lasers. 7-BLADE FAN (Deep Cut), versus a similar. 9-BLADE FAN (Smaller). Small brushless dc centrifugal 5015 turbo blower cooling fan. 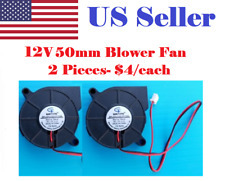 Quantity: 2pcs/lot 5015 blower fan. Plastic construction blower fan. Life: 30000 hrs. Cable Length: 18cm. Noise: 18dBA±10%. Rated Speed: 3200RPM±10%. 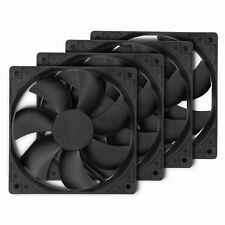 1 x Black 12V 80mm x 15mm cooling Fan. Noise: 26±10%dBA. Bearing Type: Double Ball Bearing. Life: 35000 hours. Rated Speed: 2200±10%rpm. Weight: 50g/pcs. Item Details. We will be happy to resolve any issues you may have in a cordial and friendly manner. Fan 1-8: 6 pin port, please connecting in-sequence from FAN1 to FAN8. Connect the fan to the controller with a 6 pin connector, connect the controller to the motherboard with a 4 pin connector. 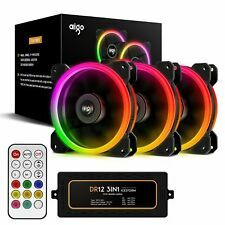 Package Includes: 3pcs 120mm Aigo LED RGB Case Fan 12pcs Mounting Screws 1pcs Controller 1pcs Remote 1x USER Manual Features:. 1 x 120mm Cooling Fan. DUAL BLADE TURBO BOOST TECHNOLOGY : Engineered for maximum pressure and airflow. Fan Speed: 1500( /-10%) RPM. 4 x Mounting Screws. Sound Level; 29dBA. HYDRAULIC BEARING : The hydraulic bearing with high quality and unrivaled performance. DC 12V 2Pin 60mm 60x10mm 60x60x10mm Mini CPU Cooling PC Computer Case Cooler Fan. High quality mini 60mm brushless dc 12v fan, sleeve-bearing design cooling cooler. 4 Pieces Brushless DC Cooling Fan. Plastic construction 11 blade fan. Heat is the #1 cause of hardware failure. The better airflow inside your system, the cooler and more stable system you will get. 120mm x 120mm x 25mm. Seven fan blades and a sleeved bearing system for less vibration, noise, and turbulence. 40mm Cooling Fan. Perfect for 3D printers and RepRap. 1 x 40mm 12V Cooling Fan. Cable Length: 15cm/6in. Local Pick Up. · mini small centrifugal blower fan 5015 dc 24V. · Unique fan design for easy thermal heat dissipation, low noise. · Fan Speed: 5200RPM±10%. · Rated Current: 0.1Amp±10%. · Power Connector: XH2.54-2Pin. Mini brushless DC cooling fan 12V 2Pin 40mm 40x40x10mm 9 Blades.Improve airflowin your system. Extend the life and improve the performance of your computer, 3D printer or other electronic systems. 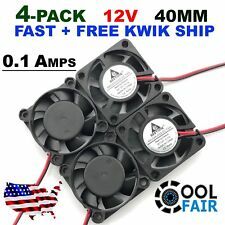 40mm x 40mm x 10mm 4010S 12V 9-Blade Cooling Fan for Computers, CPU Cooling, 3D printers and Lasers - 4 Pieces. 12V 2Pin XH 2.5 Connector 8cm 80mm 8010 Cooler Cooling Fan. The 80mm DC fan high air flow, low noise and long life. Bearing Type: Sleeve. Rated Speed: 2600±10%rpm. Rated Current: 0.15±10% Amp. Perfect Case Fan Regulation with PWM. Air Flow: 43 CFM / 73.1 m3/h (@ 1,800 RPM). eWiz is your best friend! 4-pin socket. Noise Level: 0.4 Sone (@ 1,800 RPM). Long Service Life. Two Way installation. Mfr Part Number: F12. eWiz is your best friend! Multi-Purpose Fan. Rated Fan Speed: 1350 RPM. California Law. The manufacturer seals on the item must still be intact. Request an RMA Number. Product pictures may not reflect the most recent product revision. Net Weight: 5 oz. Sound Level; 31 dBA. Speed: 1500 /- 10% RPM. Connector: 3 and 4pin connector. Static Pressure: 2.5mm/H20. Bearing Type: Sleeve. Air Flow: 3.2CFM. Our warehouse is in Illinois. We do not accept credit cards directly. 2 pcs 140mm Halo Case Fan. Fan Speed: 1500( /-10%) RPM. Sound Level; 29dBA. One year warranty. We will reply you in 24 hours and try our best to solve your problems. We stand behind our products. Bearing Type: Hydraulic Bearing. 12V 2Pin XH 2.5 Connector 8cm 80mm 8010 Cooler Cooling Fan. The 80mm DC fan high air flow, low noise and long life. Bearing Type: Sleeve. Rated Current: 0.15±10% Amp. Rated Speed: 2600±10%rpm. CPU Cooling . 9 Blade fan. This 40 mm fan has. Computer Case . The fan runs on 100 to 125V AC and contains everything needed to easily mount the fan and power it through a wall outlet. The plug cord can also be cut and be converted into lead wires to be connected to a wired AC power source. Xinruilian 2-Pin 80mm x 25mm Case FanNEW. This Xinruilian (also known as XFAN) RDH8025S1 fan has an 8" long, 2-pin power cable. 3000 RPM (±10%). Air Flow 36.95 CFM. HIGH SPEED. Speed detection NO. Bearing Sleeve. 4 pins connector male and female. Silent fan cooling system. Special high profile fan blades for maximum air flow. Fan Speed(RPM): 1200 ± 10% RPM. Provide excellent ventilation for your PC cases. 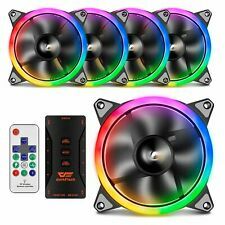 24V 40mm Fan. Great for 3D Printer and RepRap Machines. Perfect for your Computer Case or CPU Cooling. around the heatsink. This fan is super mini. Cable Length: 9. Connector: 4-Pin PWM (approx 3" Length). Fan Speed: 4600 RPM. Speed Sensor: YES. Air Flow: 23 CFM. Bearing Type: NBRX. 5V 2Pin 40mm X 40mm X 10MM Brushless DC Cooling Cooler Fan. Perfect for your Computer Case or CPU Cooling, also could be used with 3-D Printers and Lasers. 24V 40mm Fan. Great for 3D Printer and RepRap Machines. Perfect for your Computer Case or CPU Cooling. around the heatsink. This fan is super mini. Pure Wings 2 80mm PWM Case Fan. Connector: 4pin PWM. eWiz is your best friend! Air Flow: 26.3 CFM, 44.45 m3/h. Motor: 4-pole Fan Motor. Current: 0.06 A (consumption), 0.14 A (safety). Life: 80,000 hours. Excellent for cooling heatsinks on hot ends, prints, or other cooling needs. Color: Black. Bearing: Oil bearing. Wire Length: 22 cm/8". Size: 50X50X15mm. Speed: 7000±10%RPM. 80mm 3-1/8 12V Computer Muffin Fan 12 Volt DC 12Vdc for KDF-42E2000 KDF-E50A10. 4-port Fan Hub. Length of HUB Strip Cable: 400 mm. Port Type: 1x 4-pin. Extension Port: 4x 4-pin. Support PWM Function. The manufacturer seals on the item must still be intact. Back To Top. California Law. This is a high quality, dual-ball bearing fan made by Delta. BALL BEARING. Bearing Type. Noise Level 26 dBA. (approx 4"). Connector 2-Pin. Flow (Max), 60CFM. A synthetic grease, used on Mil/Aero Fans, has been added to the bearing shields and shaft to prevent corrosion. Polyurethane was also brushed on the stator to retard corrosion. See pictures for examples. Item Type: USB Fan. -The Cooling Fan can be positioned to stand upright or laid flat to cool various electronics and components. 1 x USB Fan. -Use for PC Computer, TV Box, Xbox and other electronics and components need to cooling. 4 Pin Male and Female Connector & Screws. Net Weight: 60g. Fan Speed : 1800 /-10% R.P.M. Bearing Type: Hydraulic Bearing. Total QTY: 4 Fans. Rated Current: 0.23A. Noise: 29dB (A). Perfect Case Fan Regulation with PWM. eWiz is your best friend! 4-pin socket. Noise Level: 0.3 Sone (@ 1,350 RPM). Air Flow: 53CFM (90.1 m3/h). Long Service Life. Two Way installation. Mfr Part Number: AFACO-120P2-GBA01.